Motoman VA1400 Arc Welding Robot from Yaskawa America, Inc.
"Versatile Arc” Welding Robot Ideal for High-Density Layouts.Innovative 7-axis design dramatically increases freedom of movement and maintains proper welding posture at all times. Located in lower arm, seventh axis (E-axis) acts as elbow, providing tremendous additional flexibility.Space-saving VA1400 increases productivity and achieves highest welding performance.3 kg (6.6-lb) payload; 1,434 mm (56.5") horizontal reach; ±0.08 mm (±0.003") repeatability.Integrated through-the-arm torch cabling eliminates cable interference, simplifies programming and reduces cable wear.Power cable and welding utilities (gas and air hoses) can be routed through robot base.Ideally suited for use in high-density workcells with multiple robots working in close proximity, as well as for applications that require access to parts in tight spots or those with potential interference from fixtures.Superior welding access provided by seventh axis often makes it possible to consolidate cells and simplify equipment, by eliminating need for part positioner.Advanced DX100 Controller. 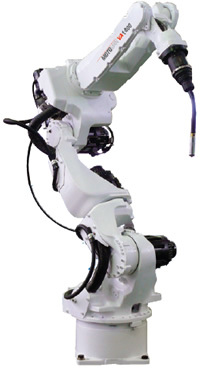 7-axis robot can reduce floorspace by providing high-density robot spacing.Versatile robot can improve joint access when mounted in wall- or ceiling-orientation.Streamlined design with seventh axis (“elbow”) improves torch access into tight spaces or reaches around both sides of part.Industry’s first two-year torch cable warranty.